“GSD” – the acronym for “getting stuff done” – is the mantra of Repair the World, a national nonprofit organization that aims to connect Jewish millennials to community organizing and service opportunities in Baltimore, New York, Philadelphia, Pittsburgh and Detroit. The group held an open house workshop on Sept. 7 at its headquarters at 3700 Eastern Ave. in Highlandtown. Between 40-50 people attended the event. The open house marked the organizational reopening of Repair the World Baltimore after a yearlong reassessment of the group’s objectives and mission. 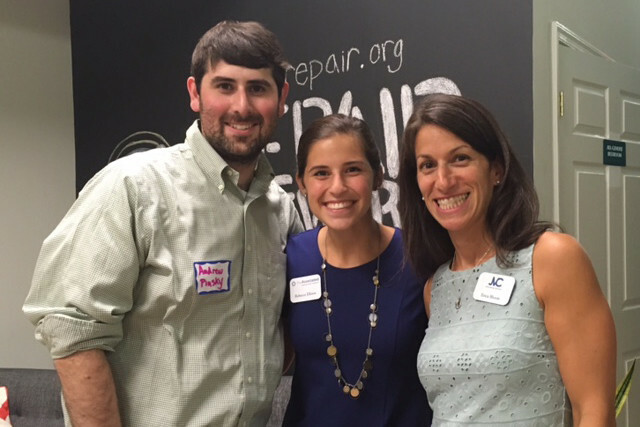 The Repair the World Baltimore group is spearheaded by a pair of Charm City natives, Josh Sherman and Diana Goldsmith. The group is a joint initiative of Repair the World and Jewish Volunteer Connection, an agency of The Associated: Jewish Community Federation of Baltimore. Among the organizations that partner with Repair the World Baltimore are Charm City Tribe, Moishe House, Jews United for Justice, IMPACT (the young adult division of The Associated), BAYITT (Beth Am’s Young Adult Initiative for 20s and 30s), and JHeritage. “I grew up in Baltimore, attended Krieger Schechter Day School and Baltimore City College High School, so this is a terrific opportunity for me to work in and serve the city where I grew up,” Sherman said of Repair the World, which launched in 2013. Goldsmith, who graduated from Towson University last December, spoke at the workshop about “ethical volunteering.” She said that listening to a community about its needs before volunteering is critical to service. “We want to make Baltimore a better place, to ensure that everyone has access to education and to quality, nutritious food,” she said. Maital Friedman, senior program director for Repair the World in New York, said at the workshop that she was impressed with the partnerships formed by the Baltimore group. JVC Assistant Director Erica Bloom strongly agreed. “I am super-excited about this partnership,” she told workshop participants. “Both our missions are aligned, and we are thus able to meet the needs of the community and meet you, the millennials, joining our efforts, where you are to better meet those needs. Two key issues driving Repair the World Baltimore include educational equality and food justice. The partnership between Repair the World Baltimore and JVC aims to “engage 1,000 individuals over the course of the year in service programming, with the hope that the volunteer work builds the capacity of our partners to achieve their mission,” said Bloom. Taylor Stewart, regional director of the group Baltimore at Leadership for Educational Equity, attended the workshop as a representative of Baltimoreans for Educational Equity. She praised the work of Repair the World Baltimore and its partners. Beth Land Hecht, senior manager of community engagement at Jewish Community Services, said she was inspired by the workshop and its participants. In addition to service opportunities with its community partners, Repair the World Baltimore will host events, service programs and Shabbat dinners. The latter will offer an opportunity to reflect on issues focused on social justice, while sharing a traditional Jewish-themed meal at its Eastern Avenue location. Repair the World Baltimore will host a Shabbat dinner on Oct. 21 from 7-9 p .m. at its headquarters. The event will be part of the group’s High Holiday Food Justice Campaign. For information about Repair the World, visit http://werepair.org/category/baltimore/ or www.facebook.com/RepairTheWorldBaltimore/ . Haydee M. Rodriguez is a Baltimore-based freelance writer.